Several first nations leaders are in court this week attempting to block Taseko Mines Ltd. from reviving a 1.5 billion dollar mine project near Williams Lake. Several B.C. First Nations leaders are in court this week attempting to block Taseko Mines Ltd. from reviving a 1.5-billion dollar mine project that has twice been refused by the federal government. Taseko is bringing forward a constitutional challenge with hopes of overturning a 2014 decision preventing it from building an open pit gold and copper mine 125 kilometres southwest of Williams Lake. The project has met with opposition over environmental issues and was rejected twice, in 2014 and in 2010, by the Harper Conservative government on advice from the Canadian Environmental Assessment Agency. "We think it's an injustice that they're even coming back wasting our time and wasting the public's time dealing with this issue," Chief Russell Myers Ross of the Tsilhqot'in national government told CBC News. 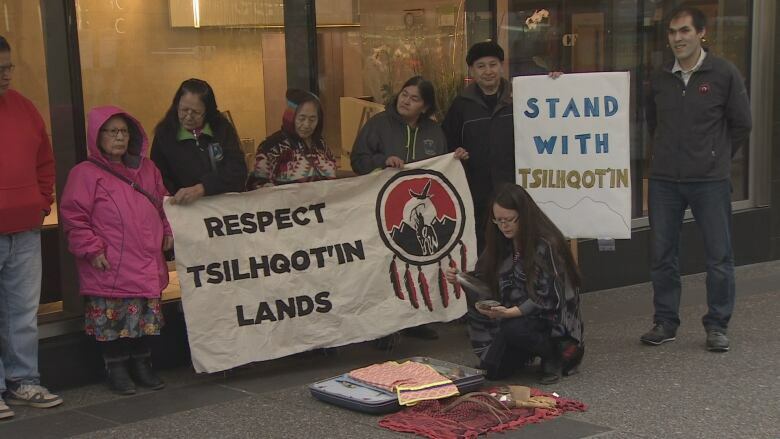 "In my opinion, TML has never shown honour or respect to the Tsilhqot'in Nation, and the current attempt to enter the territory for a drilling program while the proposal has been rejected is an example of how unethically the company behaves," he said.